Since she was 18, Alia Bhatt has been sporting a fresh make-up look and ever since she made her debut in Bollywood, she has been a fashionsta and an inspiration to many girls. With different roles and expectations, Alia has successfully made her way to the top with the excellent acting skills, her fashion and style, and make-up. Although every movie demands a specific look, Alia has never backed down from sporting her signature look whenever possible. Recently, to celebrate 20 years of Kuch Kuch Hota Hai, Alia wore her same signature look once again for a behind-the-scenes recording. If you want to re-create Alia's signature look at home for an upcoming party or a function, here's some help. Follow the simple steps mentioned below and re-create Alia's make-up in no time. 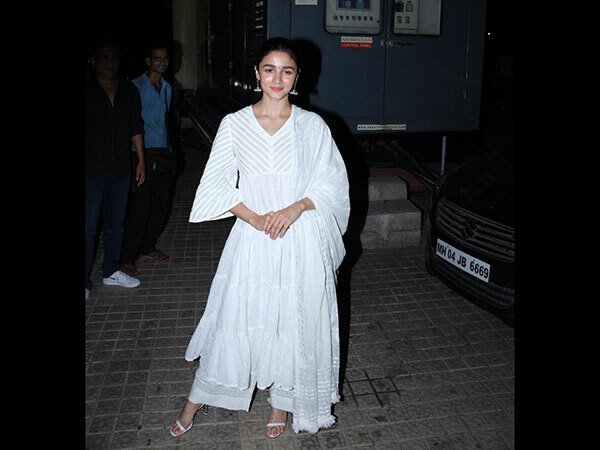 How To Get Alia Bhatt's Signature Look? Before you begin with make-up, it is always important to prep your face. Start off by washing your face with a mild and hydrating face wash. Once done, apply a moisturiser on your face and neck. It will act as a layer between your make-up and your face and will protect it from any kind of chemicals, impurities, dust, and dirt. Once you have prepped your face and applied moisturiser, start by applying foundation. To re-create Alia Bhatt's look, you need to use an aqua-based foundation which will give your face a dewy look. Avoid using matte foundation here. After applying the foundation, you can use a concealer to hide blemishes, acne, or dark spots, however, concealer is optional. If you have a clear skin, you can directly move on to filling your brows after foundation. If you spot any gaps between your brows, you can simply use a brow filling make-up brush and draw your brows. You can even give a shape to your brows with the help of this brush, however, do not go overboard with it and maintain your original shape. After filling your brows, you can work your way to your eyes. Start by applying a cool, pink toned, silvery pink coloured cream eyeshadow. Apply it all over your crease and top it off with a similar coloured powder eyeshadow blended with a beige one. Next, apply a thin line of kohl or eyeline - whichever suits your preference and apply a generoud amount of mascara to your lashes. You can even curl your lashes using a lash curler before applying the mascara. Once your eyes are all set, you can move on to contouring your face by using a contour powder. Next, dust some soft pink-hued blush on your cheeks to highlight your cheekbones and the high points of your face. Lastly, use a hydrating and moisturising lip balm on your lips and then apply a light coat of pink coloured glossy lipstick or a lip gloss to complete your look. Such a simple way to re-create Alia Bhatt's signature look, isn't it? This look will completely suit any kind of occasion. All you need to do is pair it up with the right attire and you are good to go.